Apologetics Press - Space: The Womb of Life? If there is no God, as the atheist claims, then how did life originate? Did it spontaneously generate? Many concede that there’s just too much scientific evidence against abiogenesis for it to be palatable (see Miller, 2012). But if life did not create itself, it had to come from somewhere, and the atheist “cannot allow a Divine Foot in the door” (Lewontin, 1997, p. 31). So, where is he left? Outer space? That is precisely what many in the evolutionary community are hoping for. Of course, this seeming solution is merely a mirage. Simply pushing the problem of abiogenesis off to another place in the Universe does not solve the problem. It is a tactic to forestall the inevitable, hoping that, since there is so much we do not know about the Universe, abiogenesis may be possible elsewhere. But in reality, the problem remains. There is no scientific evidence to substantiate the idea that the laws of the Universe would allow the formation of life from non-life. We must still await the development of a legitimate answer from the atheist: from whence came life? Regardless of this attempt to divert attention from the problem of abiogenesis, there is a growing interest in the prospect that life could have originated from space. Recently, a NASA scientist, Richard Hoover, of the Marshall Space Flight Center in Alabama, authored an article in the Journal of Cosmology in which he claimed to have discovered evidence of microfossils—fossilized extraterrestrials—in a meteorite that hit France in the 1800s (Hoover, 2011). Michael Lemonick, science writer for Time,said, “[M]aybe life first arose in outer space and came to earth fully formed. It’s an astonishing idea, but it’s not completely crazy” (Lemonick, 2011). Skepticism abounds in the scientific community concerning Hoover’s discoveries, since claims of proof of extraterrestrial life have always proven to be bogus (e.g., Taylor, 1997; Nagy, et al., 1963). Biologist, P.Z. Myers, of the University of Minnesota Morris, said regarding Hoover’s discovery, “This work is garbage. I’m surprised anyone is granting it any credibility at all…. I’m looking forward to the publication next year [in the Journal of Cosmology—JM] of the discovery of an extraterrestrial rabbit in a meteor” (as quoted in Lemonick). Chief scientist in the science division at NASA, Paul Hertz, even said that Hoover’s article was rejected from publishment in a more established, peer-reviewed journal. Concerning Hoover’s article, he said, “While we value the free exchange of ideas, data, and information as part of scientific and technical inquiry, NASA cannot stand behind or support a scientific claim unless it has been peer-reviewed or thoroughly examined by other qualified experts” (as quoted in “Alien Life in Meteorites: ‘Remarkable Achievement’ or ‘Garbage’?” 2011). This stance by NASA casts serious doubt on the validity of Hoover’s claims, and yet he is not alone in his theory about life originating from outer space, in spite of the lack of evidence to support it. So, the hope remains alive. 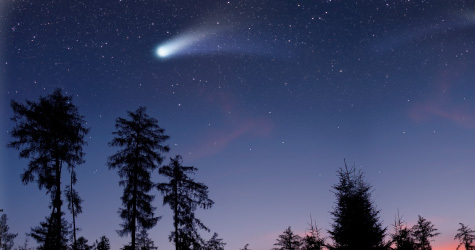 Astronomers have recently found organic materials in meteorites (e.g., Nakamura-Messenger, et al., 2006), which some believe could be proof of previously living organisms in outer space and that “may have seeded the early Earth with the building blocks of life” (Jeffs, 2006). Mike Zolensky, a NASA cosmic mineralogist, said, “If, as we suspect, this type of meteorite has been falling onto Earth throughout its entire history, then the Earth was seeded with these organic globules at the same time life was forming here” (as quoted in Jeffs). Sun Kwok, the Dean of Science and Chair Professor of Physics at the University of Hong Kong, said, “If this is the case, life on Earth may have had an easier time getting started as these organics can serve as the basic ingredients for life” (as quoted in Chow, 2011). Organic materials are generally defined as decayed materials which contain carbon (like life forms on Earth), presumably because the materials were once living. No wonder the articles discussing such discoveries are riddled with disclaimers—“if,” “maybe,” “might,” “possibly,” “could,” “potentially,” and “think” are commonplace with scientific speculation, as they are in the articles reviewing this find. However, if a person pays too much attention to the brazen, irresponsible, misleading titles oftentimes given to the latest discoveries by the media, the subtle disclaimers can easily be disregarded or altogether missed (e.g., “Life on Mars,” Jaroff, 1996). For instance, in the last sentence of its article on the discovery, ScienceDaily admitted, “Whether these delivered organic compounds played any role in the development of life on Earth remains an open question” (“Astronomers Discover…,” 2011, emp. added). Toward the end of their article on the discovery, Space.com noted that Kwok admitted, “While it may be too soon to determine whether these organic compounds played a role in kick-starting the development of life on Earth, it certainly is a possibility” (Chow, emp. added). One can speculate, conjecture, and engage in baseless hope all he wants, but the truth remains: organic materials from space do nothing to help the evolutionist move from the scientific impossibility of jumping from non-life to life in nature. A second problem is that terrestrial contamination is always a significant factor scientists must consider in any studies involving extraterrestrial materials passing through the Earth’s atmosphere and reaching the Earth, and this has historically been the case. How can a scientist know with certainty that a meteorite, moving at immense speeds, that literally smashes into the carbon-bearing Earth, has not been contaminated with terrestrial organic compounds? Scientists recognize this as a potential factor in this case as well, by noting that the location of the meteorite could have helped in “minimizing terrestrial contamination” (Jeffs, 2006). This implies that terrestrial contamination could still have been a factor, though, they hope, “minimized.” It cannot be considered a non-issue in the discovery. In other words, nothing can be said conclusively about what has been found in this meteorite from the 1800s. [s]uch chemical complexity was thought to arise only from living organisms, but the results of the new study show that these organic compounds can be created in space even when no life forms are present. In fact, such complex organics could be produced naturally by stars, and at an extremely rapid pace (Chow, emp. added). ScienceDaily adds, “Most interestingly, this organic star dust is similar in structure to complex organic compounds found in meteorites” (“Astronomers Discover…,” emp. added). In response to his co-discovery, Kwok said, “Nature is much more clever than we had imagined” (as quoted in Chow). So, these organic materials that are apparently found “everywhere in our own galaxy and in other galaxies” (Chow), which coat meteorites that collide with Earth, are not proof of life in outer space at all, since stars—non-living entities—can give rise to organic materials. Instead of continuing to trust blindly in the assumption of abiogenesis, which has thrust naturalistic scientists into space to try to find hope for their failed theory, why not interpret this latest find in a more reasonable way? This new discovery adds more weight to the dangers inherent in organic dating techniques, like radiocarbon dating, since such techniques rely on the fundamental assumption that organic materials are produced through the decay of bio-materials (i.e., materials which were once living). If, as this latest discovery suggests, organic materials can come about through other processes, caution should be taken in relying heavily on modern dating techniques for dating anything thought to be very old. The Creation model contends that such dating techniques are useless when used to date extremely old materials (i.e., materials older than a few hundred years), because those techniques assume a constant (slow) rate of decay and no contamination from outside sources. This latest discovery supports that contention. Another fascinating and telling implication from this discovery regards the formation of coal and oil, which evolutionary geologists believe to be a process which takes immensely long periods of time to complete. According to Kwok, the organic compounds discovered are “so complex that their chemical structures resemble the makeup of coal and petroleum” (Chow). And what’s more, these complex organics which are thought to be produced naturally by stars, are formed “at an extremely rapid pace” (Chow). Kwok explains, “Coal and kerogen are products of life, and it took a long time for them to form. How do stars make such complicated organics under seemingly unfavorable conditions and [do] it so rapidly?” (as quoted in Chow). Scientists have no explanation as yet, since such a find stands as firm, conclusive evidence that uniformitarianism—a fundamental tenet of evolutionary geology—is unreliable. Granted, these compounds have been discovered in space, not on Earth, but as this article indicates, the growing contention among evolutionists is that these organic compounds have been traveling to Earth throughout history. If correct, this discovery should certainly affect the interpretation of geological discoveries and affect dating technique assumptions. Another thing can be inferred as well if organic compounds can be manufactured rapidly by inorganic sources. It may be the case that there are terrestrial processes going on now (or that were in effect in the past) that are doing the same thing—rapidly producing organic materials by inorganic sources—unbeknownst to us at this point in our scientific understanding of the Earth. The rapid production of organic materials by stars is evidence that viewing geological phenomena through the lense of catastrophism is a much more reasonable approach than uniformitarianism at interpreting geological processes. Bottom line: atheistic evolution is not a plausible model for interpreting scientific data. No plausible scientific method has been developed to substantiate the idea that the Universe is extremely old. Uniformitarian principles fall short in their attempt to date the Earth, unlike catastrophism—a model which is supported by the Bible. Life does not come from non-life in nature. Organic compounds from outer space cannot solve the problem since the problem of abiogenesis remains. The search for the existence of aliens in order to explain the origin of life is unnecessary, since there is abundant evidence which supports the truth that there is a God who created the heavens, the Earth, and everything in them in six days (Exodus 20:11). Trust the Bible. It’s always right. “Alien Life in Meteorites: ‘Remarkable Achievement’ or ‘Garbage’?” (2011), Fox News, March 7, http://www.foxnews.com/scitech/2011/03/07/alien-life-meteorites-skeptics-believers-weigh/. “Astronomers Discover Complex Organic Matter Exists Throughout the Universe” (2011), ScienceDaily, The University of Hong Kong, October 26, http://www.sciencedaily.com/releases/2011/10/111026143721.htm. Chow, Denise (2011), “Discovery: Cosmic Dust Contains Organic Matter from Stars,” Space.com, October 26, http://www.space.com/13401-cosmic-star-dust-complex-organic-compounds.html. Hoover, Richard B. (2011), “Fossils of Cyanobacteria in CI1 Carbonaceous Meteorites,” Journal of Cosmology, 13, March. Jaroff, Leon (1996), “Life on Mars,” Time, 148:76-82, August 19. Jeffs, William (2006), “NASA Scientists Find Primordial Organic Matter in Meteorite,” NASA: Johnson Space Center, Release J06-103, http://www.nasa.gov/centers/johnson/news/releases/2006/J06-103.html. Kwok, Sun and Yong Zhang (2011), “Mixed Aromatic-Aliphatic Organic Nanoparticles as Carriers of Unidentified Infrared Emission Features,” Nature, 479:80-83, November 3. Lemonick, Michael D. (2011), “Alien Life Discovered in a Meteorite! Or Maybe Not,” Time Science, http://www.time.com/time/health/article/0,8599,2057461,00.html. Miller, Jeff (2012), “The Law of Biogenesis,” Reason & Revelation, 32:2-11, January, Apologetics Press, http://apologeticspress.org/apPubPage.aspx?pub=1&issue=1018&article=1722. Nagy, Bartholomew, Warren G. Meinschein, and Douglas J. Hennessy (1963), “Aqueous, Low Temperature Environment of the Orgueil Meteorite Parent Body,” Annals of the New York Academy of Sciences, 108:534-552, June. Nakamura-Messenger, Keiko, Scott Messenger, Lindsay P. Keller, Simon J. Clemett, and Michael E. Zolensky (2006), “Organic Globules in the Tagish Lake Meteorite: Remnants of the Protosolar Disk,” Science, 314:1439-1442. Taylor, Chris (1997), “Is There Life on Mars?” Time U.S., http://www.time.com/time/nation/article/0,8599,9976,00.html.